Yes, there is a difference between shaving in the shower and shaving immediately upon exiting the shower: time and colder air (especially in the winter). The first requirement for shower shaving is a shower large enough to shave in. While its possible to successfully shave in a narrow stall shower it’s not all that easy. So for this article I am going to assume that the shower in question is either a bathtub shower or a stall large enough that there is a space where you can stand where the water only hits your back AND you’re not plastered against the shower wall/door. Besides shower real estate, you’re going to need a mirror (optional for the truly brave) and the shower equivalent of counter space. The Shave Well Company makes a $10 fog-free shower mirror which hangs from a suction cup mounted hook. Mine is mounted on the wall opposite the shower head. I don’t leave the mirror on the hook between showers, out of fear the suction cup will fail and I’ll have broken mirror. As for “counter space” there are many possibilities. Just Google (or search Amazon or visit a Bed Bath and Beyond) for shower shelf options. There are free standing units, shelves that hang from the shower head and shelves that suction themselves to tile wall, to name a few. I keep a wood lathering bowl, a covered shave soap container, and a shave cream bottle (I superlather!) on the top shelf of a free standing shower shelf unit (stall shower, not a bathtub) at the far end of the shower. I keep my brush and razor in a stand on a shelf under the shower head along with a mug for hydrating my brush. At the start of my shower I perform two tasks. First I fill my mug with hot (duh!) water and put my brush in it to soak up water. Second, I hold the mirror under the water for 5-10 seconds; half on the front and half on the back. The manufacturer’s fog-free claim is really just wishful thinking. Shower mirrors fog up due to temperature differentials: cold mirror, hot air. This helps in warming up the mirror. One can also periodically apply commercial products like Rain-X or toothpaste to your mirror if you wish – I don’t bother. Now, just enjoy your usual shower – and don’t forget to wash behind your ears! After you’ve soaped up or shampooed all the body parts you intended to, it’s time to get down to your shave. Grab that mirror again and spend another 5-10 seconds running hot water on both sides. Pretend you’re about to go SCUBA diving and spit on the mirror surface, rinse and hang on its hook. At this point, things should proceed pretty much as they would if you were standing at your sink, only you’re in a steam filled shower with a stream of hot water hitting and running down your back. The mirror is mounted on the wall opposite the shower head – remember? 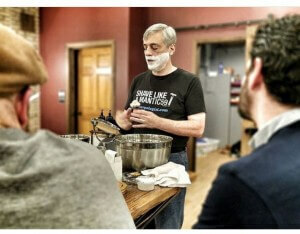 With your lathering bowl and brush out of the water stream, you should enjoy your one, two or three pass shave. Blade rinsing involves nothing more than holding the razor over my right shoulder for a second or two. A word about lather. Some lathers, after building, are more watery than others. Given all the moisture, water and hot steam, I recommend firmer rather than softer creams/soaps. Since you’re effectively shaving in a sauna, you’ll need a lather which hasn’t dissolved by the time you’re ready for your second or third pass. Post-shave cleanup should be a breeze. Before cleaning up, I rinse my face. Sadly, this is a hot water rinse, unlike the standard pore-closing cold water rinse you’d enjoy at the sink. I keep a bottle of witch hazel on a shelf along with the shampoo collection. After washing off the lather, I rub some witch hazel on my face before cleaning up. It’s a fast task to give the razor a final rinse, run the brush under the shower and give a vigorous shake or two, put the mirror away, and finally rinse out the lathering bowl. When all is put away, I wash my face (again) with my bar soap and turn off the water. Towel dry, apply your aftershave balm of choice and deodorant (never an antiperspirant! ), and exit the shower confident no one is going to yell at you for not cleaning out the stubble and soap ring from the sink, or a wet bathroom floor from sloppy post-shave rinsing. While your mileage will vary, hopefully, you’ll have enjoyed a moist, irritation and nick/weeper free shave. Nice to get some shower saving love on the site. I honestly hate shaving any other way. Perhaps it’s just because I’m lazy but shower shaving and face lathering (usually a good quality cream) always made the most sense to me. While I’m completely obsessed with my preshave prep, I’m not at all fascinated with stuff like seeing if I can lather some particular soap. Like I said, I’m lazy. Shaving in the shower minimizes time spent, any hydration issues and the cleanup. Yes, there is a concern with water use. But in my case, I doubt I use much more water shower shaving than shaving at the sink. I’m sure that isn’t true for all, though. I have a very good flow control on my shower head (plus the option to turn it completely off). And I need time for my hir conditioner to do its job (don’t judge!). And when I shave at the sink, I use a crap-ton of water—probably more than most, and certainly more than I should. But hey, that’s what I do. After have the perfect shower setup, I moved to a very small shower stall—not at all, I thought, fit for shower shaving. I shaved at the sink for maybe two weeks. Then I found the right shower accessories to make the small stall work for me. If you have an imagine and will, there is usually a way. Only downside to shower shaving is the waste of water and the energy to heat it. In a year’s time I suppose that could mount up.